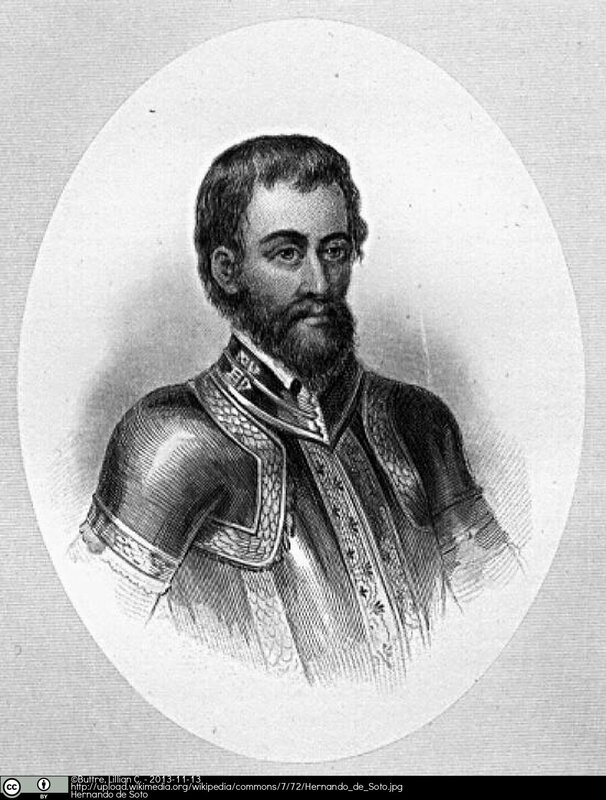 Apparently Hernando De Soto pursued an Indian maiden through the forest and up a live oak tree. During the chase his gray beard became entangled in the tree, giving the maiden an opportunity to escape. De Soto freed himself, but several wisps of his beard were left behind. 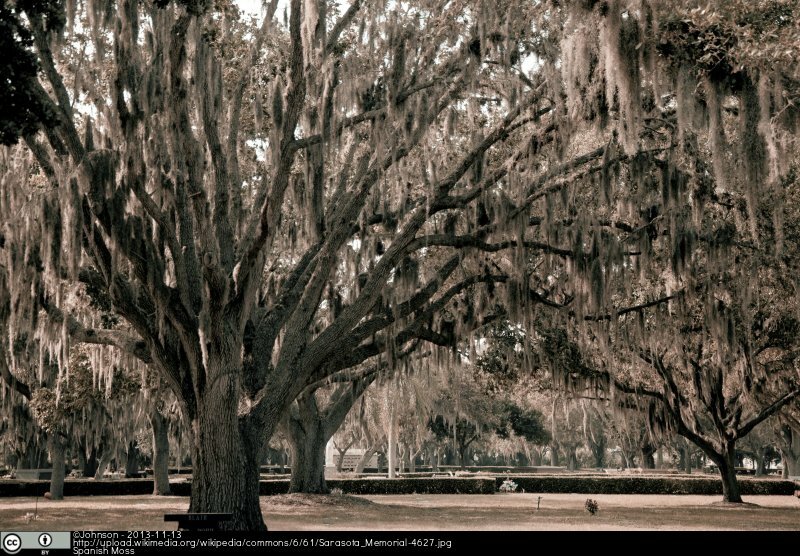 These remnants became Spanish Moss . The name Spanish Moss is quite misleading. Firstly, this plant isn’t even Spanish. The dangling beard-like festoons are found across much of the Americas adorning bald cypress (Taxodium distichum) and southern live oak trees (Quercus virginiana) or even telephone wires and fences. Spanish Moss isn’t a moss either. It belongs to Bromeliaceae a family of frequently epiphytic, rosette plants with spirally arranged leaves. It is likely to have been earned its rather confusing name because of its moss-like appearance and abundance throughout much of the former Spanish colonies of the New World . The more reliable binomial for Spanish Moss is Tillandsia usneoides (L.)L. The genus Tillandsia was named after after a Swedish physician and botanist Elias Tillandz, while the the specific epithet usneoides means ‘resembles usnea’, a genus of lichens also known as the beard lichens . T. usneoides is arguably the most specialised member of Bromeliaceae. It is a slender epiphytic perennial which has shed the requirement for roots, relying upon its corkscrew-like stems and acicular (needle like) leaves to tangle around themselves and other objects for support. It hangs in festoons around 8m long and has been reported to grow up to 30m long as a result of numerous shorter individual plants overlapping each other . T. usneoides possesses rather elegant small inconspicuous flowers that are typical of Bromeliaceae, with a calyx of 3 sepals, a corolla of 3 green petals, 6 stamens, and a 3-lobed stigma. The flowers do not last for long but they have a pleasant fragrance, which attracts a variety of insect pollinators . T. usneoides possesses a degenerate vascular system without a functional xylem. Instead the plant absorbs water and minerals from atmospheric precipitation over the entire surface. A dense covering of specialised trichomes (scales) which gives the plant its characteristic silvery-grey appearance, aids the absorption of water and minerals from the atmosphere . When the plant is dry the scales flex and pull away from the surface. If it rains, the scales readily take up water and lie flat on the surface of the plant allowing absorption to take place. It has been suggested that the dry scales may also play a role in reducing transpiration and reflecting strong light (photoprotection) . There would also appear to be no need for a functional phloem, since all living cells either contain chlorophyll and are exposed to light, or are nearby to those containing chlorophyll. T. usneoides fixes carbon by Crassulacean acid metabolism (CAM), an adaptation to arid conditions in which carbon dioxide enters the stomata at night to reduce loss of water in its cells . T. usneoides has an almost continuous distribution from its northern limit at Virginia USA to Patagonia in South America making it the most widely distributed member of this family and supposedly one of the worlds most far ranging plants ! It owes its extensive distribution not only to its adaptations but also its ability to propagate effectively. Pollinated flowers release seeds that are easily dispersed by wind due to the presence of long delicate hairs which act as a parachutes, similar to the seeds of Dandelions. These hairs also possess tiny barbs that help to anchor the seed in the cracks of rough bark or other festoons of moss where it can germinate and establish as a seedling . While T. usneoides is able to reproduce by sexual means quite efficiently, its widespread distribution can largely be attributed to its vegetative reproduction. Fragments of festoons, are easily carried by the wind and its distribution shows a good correlation with the major storm paths across the US. The soft and pliable nature of T. usneoides also makes it suitable for use in nest building by birds. Fragments have been found in the nests of many Florida birds including parulas, yellow-throats, pine warblers, painted buntings, robins, and swallow-tail kites. Perhaps unique to this species is alligator dispersal as female alligators in southern Florida occasionally use the plant to construct nests ! One pre-Linnaean name, Cuscuta americana super arboles se dissidens mistakenly places T. usneoides in the genus Cuscuta, a parasitic member of the morning-glory family . This misconception continues as many people wrongly believe that it is parasitic on its host trees. In reality it is an epiphyte, only using the tree for support. 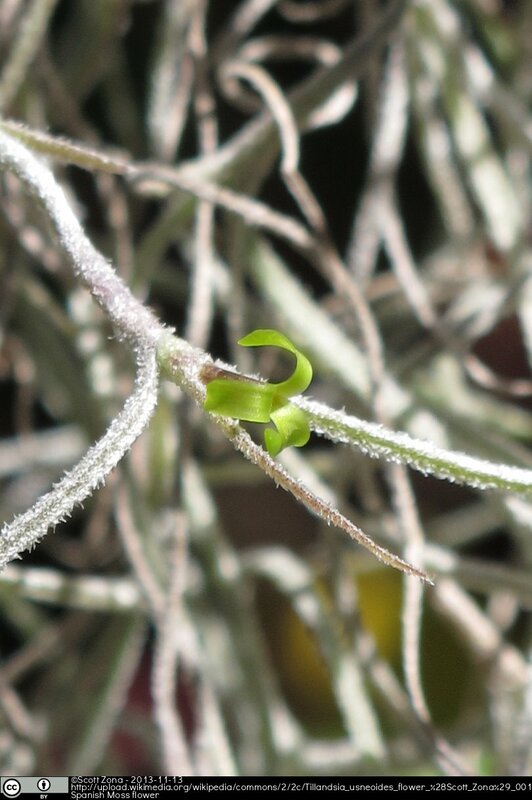 The fact that T. usneoides grows on the steel frame and a dangling cable of our Tropical Greenhouse, shows quite nicely that it does not require anything else from its host other than support. This negative association may stem form the fact that T. usneoides grows well on trees that are dead or already in decline, with the thinning canopy allowing more light to reach the moss . The degenerate vascular bundle of T. usneoides is surrounded by a mass of thick-walled sclerenchyma that yields a tough elastic fibre which has long been used in the southern US as a packing material in upholstery . To obtain the fibre, festoons of the plants were harvested from trees using long poles (up to a tonne from one tree) and ‘cured’ by burying the plant material in pits or trenches until the living, green tissue decayed and only the black vascular tissues remained . In the early 20th century, wild T. usneoides was collected on an almost industrial scale and used in the upholstered seats of luxury trains, busses, airplanes, yachts and even the seats of the early Ford Model T cars are said to be filled with these strong elastic fibres. Considered in 1937 by Popular Science Monthly to be ‘odorless , sanitary, naturally mothproof, and to have a lasting resiliency which is surpassed by that of only the finest grades of horsehair’ . While it no longer has such an economic importance, it has been suggested that T. usneoides can potentially be useful as a bioindicator of air quality. Since it absorbs its water and nutrients directly from the air, the tissues of the plant will contain the same level of pollutants that is in the atmosphere . 1. Bennett, B.C. (1986) The Florida Bromeliads: Tillandsia usneoides. Journal of the Bromeliad Society 36: 149-151. 2. Billings, H. (1904) A Study of Tillandsia usneoides. Botanical Gazette 38: 99-121. 3. Filho, G.M., Andrade, L.R., Farina, M. and Malm, O. (2002) Hg localisation in Tillandsia usneoides L. (Bromeliaceae), an atmospheric biomonitor. Atmospheric Environment 26: 881-887. 4. Heywood, V.H., Brummitt, R.K., Culham, A. and Seberg, O. (2007) Flowering Plant Families of the world. Ontario, Canada: Firefly Books. Botany student with an interest in communicating and raising awareness of the curious world of plants! This entry was posted in Americas, Learning and Teaching, Neotropics, Species, Students and tagged America, Bromeliaceae, Epiphyte, Spanish Moss, specialised trichomes, species distribution, Tillandsia usneoides. Bookmark the permalink.